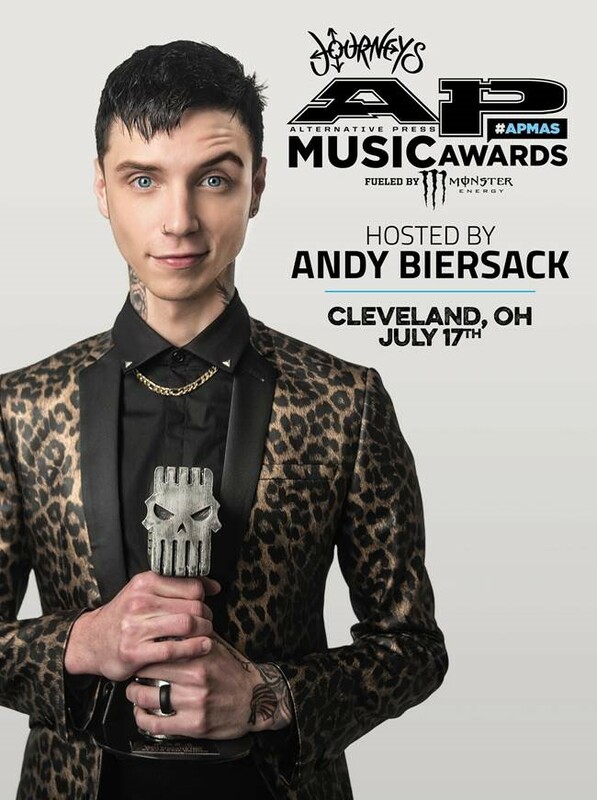 CLEVELAND, OH – The Journeys Alternative Press Music Awards, Fueled by Monster Energy Drink are thrilled to present this year’s host – none other than inimitable Black Veil Brides frontman, alt-pop artist and raconteur extraordinaire Andy Biersack – more recently recognized by his solo moniker Andy Black! Since bursting onto the national scene in 2010 as the striking frontman of rock superstars Black Veil Brides, Biersack has rapidly risen to greatness-not only topping the music charts, but weaving his way into the hearts of fanatical followers worldwide. After reaching next-gen hard rock icon status with the release of four chart topping full-length albums, various other releases and singles with Black Veil Brides, Biersack ventured out on his own – starting his alt-pop solo project under the name Andy Black. His latest solo release, The Shadow Side, debuted on the charts worldwide. Cinematic in scope, ambitious in concept, yet down-to-earth in execution, The Shadow Side is as decidedly personal for Biersack as his work in Black Veil Brides is outspoken, taking a further step outward with its intimate confessional vibe and galvanizing populism. Last summer, after another successful year of extraordinary performances, exciting surprises, interactive onsite activities and an action-packed, star-studded red carpet, the Journeys Alternative Press Music Awards, Fueled by Monster Energy Drink further solidified itself as the biggest, most popular celebration of alternative music on the planet. In December, the APMAs announced that this year’s event would return to Alternative Press‘ home city of Cleveland, Ohio on July 17! The APMAs promises even more of what fans have come to expect from the show- huge stars and incredible performances – presented on a scale worthy of the most exciting genres in music. Details regarding the 2017 APMAs venue, tickets and VIP packages, nominees, honorees, attending/performing artists, red carpet appearances, surrounding events and more will be announced soon via www.altpress.com/apmas. Last year’s APMAs trended worldwide on Twitter and Facebook for over 72 hours – before, during and after live streaming on Amazon Music‘s official Twitch channel, reaching a staggering 500,000-plus viewers. The APMAs were the most viewed stream on Twitch the day of show, in addition to being the No. 3 most viewed music stream in the platform’s history. Social media reaction and fan response spread fast and furious across the internet following the red carpet and awards ceremony, garnering millions of impressions. In addition, over 6,000 diehard alternative music fans attended the live show in person. Fans enjoyed hours of snapping pics and rubbing elbows with celebrities and artists outside the red carpet (streamed live via tumblr. ), had merch and other items personally signed by their favorite bands at the Monster Energy Artist Signing Truck, enjoyed a front-row view of the electrifying live show action in the Fearless Records Fan Pit and capped off the night celebrating at the official fan afterparty at Skully’s Music Diner. If you missed out on the fun last year, check out the 2016 ultimate highlight reel here. Each APMAs show has featured some of the greatest artists in modern music, ranging from today’s biggest rock stars such as Fall Out Boy, Hayley Williams of Paramore, Panic! At The Disco, Twenty One Pilots, Machine Gun Kelly, Papa Roach, Pierce The Veil, PVRIS, Black Veil Brides, Tyler Posey of MTV’s Teen Wolf and Weezer, to musical legends such as Aerosmith‘s Joe Perry, Slash, Joan Jett & The Blackhearts, Billy Corganof the Smashing Pumpkins and Ice-T. Countless renowned artists such as Rob Zombie, Mark Hoppus of Blink-182, Taking Back Sunday, All Time Low, Motionless In White, Marilyn Manson, Run of RUN DMC, Coolio, Oli Sykes of Bring Me The Horizon, and beyond have appeared at the APMAs, with spectacular performances from artists including (but not limited to) New Found Glory, Yellowcard, A Day To Remember, Laura Jane Grace of Against Me!, Third Eye Blind and more. Additionally, the APMAs are recognized for presenting collaborative cover performances unlike music fans have ever seen before, including Joan Jett and Slash teaming up to perform “Star Star” by the Rolling Stones, Asking Alexandria performing Duran Duran‘s “Hungry Like The Wolf” with Jonathan Davis of Korn, Halestorm and Slipknot/Stone Sour vocalist Corey Taylor covering Temple Of The Dog‘s “Hunger Strike,” Rob Halford and BABYMETAL performing Judas Priest classics “Breaking The Law” and “Painkiller” and many more. For over 32 years, Alternative Press continues to be on the forefront of discovering new artists, breaking news and reporting on the latest trends in music and youth culture. Since its early days as a pasted-up fanzine in the mid-’80s, Alternative Press is one of the largest music magazines in the world. AP provides in-depth interviews and exclusive photos, making it an essential collectors piece for a passionate fan base, as well as digitally through various mobile and tablet formats. AP has expanded its digital reach via an enhanced mobile app and Altpress.com, one of the world’s fastest-growing websites. The site has become a necessary destination for up-to-the-minute breaking news, coverage from our national APtv correspondents, exclusive multimedia premieres and much more. Additionally, the brand has been successfully extended through live events, beginning with the launch of the AP Tour and the company’s inaugural AP Music Award Show, which trended No. 1 worldwide on Twitter and Facebook. Independently owned and operated, AP continues to reach millions of fans, offering them insight to the hottest artists and cultural trends first. Journeys is a leader in the teen specialty retail scene, with more than 840 stores in all 50 states, Puerto Rico and Canada. Journeys uses fashion savvy and merchandising science to keep in step with the fast-paced footwear and accessories market for 13- to 22-year-old guys and girls. Journeys offers a wide variety of trendy, relevant brands that cater to teens who seek the hottest, new styles. The Journeys store is more than a retail environment; it’s an extension of the teen lifestyle. From the plasma TVs playing exclusive content and the latest music videos, to the visual merchandising strategy and promotions, to the employees whose image and style reflect the customers’ lifestyle and attitude. In addition, Journeys reaches its customers through www.journeys.com & www.journeys.ca, catalog, national advertising, strategic cross-promotions, social media and grass-roots events like national concert tours and the Vans Warped Tour. Journeys is, in every way, an attitude you can wear!